looks very nice. but i hope youll be running a narrower tire on race day. i think youll fine those to be too wide. look forward to hearing about it making passes this season. good luck. 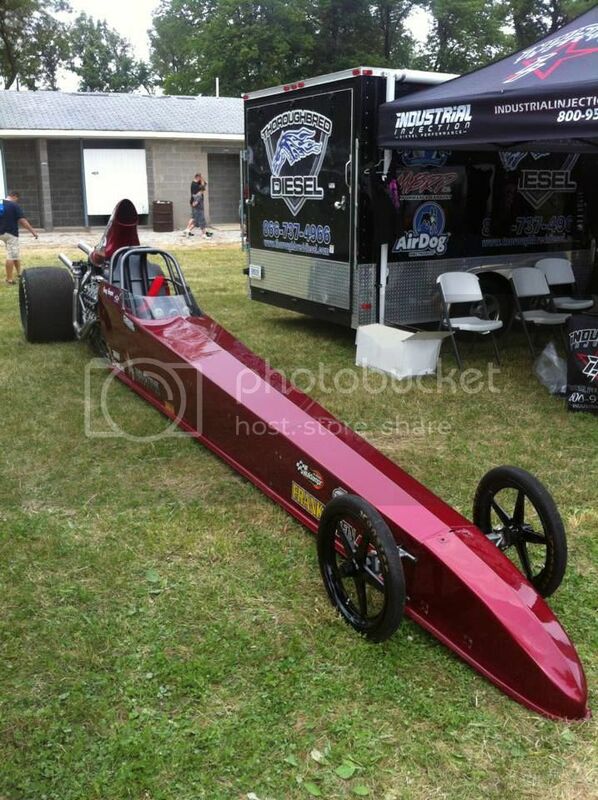 ^^§Dragster looks good. Why didn't you make a pass? Drive from Texas to Indiana. Don't make a pass. Shake hands and kiss babies, and try to find some more sponsors. i dont think it's sponsors he needs...its someone with common sence to finish his rail correctly and safe...and to drive it! 2006 Dodge Mega Cab Dually - "MOBYDK"
CompD Mod White Dodge Club, member #1. Last edited by THATpreston; 06-23-2013 at 02:57 PM. ... Greg I'm building another car right now & I bet I get It done before u ever get that 7 year " quest for the 6's !!" heap down the tack .. The entire event went off without a single drunk or idiot, why can't other events be this way,. Actually, I believe several other diesel events have gone off without any major events, but you have to go to them to see it with your own eyes. Imho. the day of the dinosaur is over in Pro Street. You slay me.....knocking the powerplant that you cut your diesel teeth on. We should embrace ANY motor (program) that gets more people to a track. Right? Glad your car made it to a diesel event....even if only in show mode. Congrats to NADM on a nice event. Last edited by THATpreston; 06-23-2013 at 05:53 PM. DAMN just like the good old days, all is right with the world after all. It was a great event. We enjoyed it. Wish more people would come to the next one. Thank you guys, and to everybody that made this show, its taken years to rebuild it to this level, and many made a point to say its looking like the old days. The race on a Friday night was a HUGE improvement over the last second, Saturday morning deal the year previous. Different track manager helped. The shot of rain helped cool things down and moisten the pulling track, and I don't think it hurt spectator count much, as the gate crew stood through the storm, to keep traffic moving. Everybody was well behaved, thanks to all who came, we appreciate it. Oh, look everyone, it's Wade the Hypocrite again! Wade, since you never forget to first thank your "Lord and Savior Jesus Christ," I'd like to ask you, which part of His book justifies you coming into a thread about a race you did not participate in, and throw insults at someone else? Does anyone wonder if God chuckles when someone hurling insults cannot even spell the insult correctly (and does so repeatedly on basic words)? Proverbs 15:2....The tongue of the wise uses knowledge rightly, but the mouth of fools pours forth foolishness. Glad NADM had a good event. Good one but yet again you fail to realize what the context of my response was.. Behind the keyboard in reality he has done and caused a lot of grieve with other racers and teams....even though he hasent raced in several years!!! Now im not here doing anything but speaking the truth, because right is right and wrong is wrong. Jesus did the same when he found the money changers selling, lieing and cheating others and bardering products in the church! He told them they were wrong and kicked them out and over threw there tables...!! MATT 21 if you care to read. Nothing i've said nothing about greg that is not true. Sure i could have sat back and watched him do wrong to the sport and it's racers...but that was so 6 years ago.. he's screwed me and many others on a personal level, now even though he dont race he is trying to aggrevate our sport...you may not see it, but i do. Now i stand up for my sport and my fellow Racers. Greg would be fine if he would just shut up, build his ride and leave everyone else alone. Last edited by DIESEL_POWER; 06-23-2013 at 11:31 PM. It was a good time at the drags Friday night / Saturday morning. I don't think we got done racing until 12:30am. Jared and team are stand up people and it was good talking to you guys again. Thanks to the NADM for a great race. I had a good time and it was a good turn out. rain did cool it off. A group I was with were talking about leaving because of the light rain. I told them it is what the track needed and would cool the air for all of us. They stayed and looked like they had a good time too. 1998 12 valve 4x4 2500 auto trans. You are most assuredly not standing up for the sport. You are no better than the idiots who bash you. TOO MANY racers and their fans eat their own, and I cannot BELIEVE I just read your last sentence. Can you spell hippokrit?